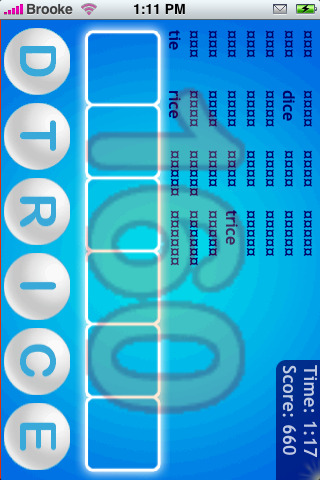 Thanks to the developer of TextTwist – digicide. 1. Add the Jiggy Main Repository source. 2. Install version .25 of Jiggy and Jiggy Runtime or higher. 3. 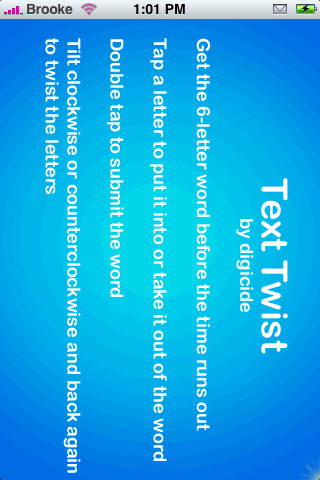 Download the TextTwist zip file HERE. 4. Unzip the TextTwist file and save it to your computer. 5. Drag the TextTwist.app file from your computer to your iPhone via SSH into the /Applications folder. 6. Change the permissions of the TextTwist.app folder to 0755. To do this, just select all the files in the TextTwist.app folder, right click, select properties and change the Octal to 0755. 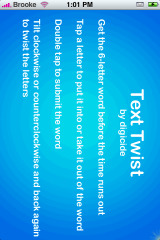 You will also need to open the two folders, letters and messages, inside of the TextTwist.app and do that same thing. There you go! You should be able to see the TextTwist icon on your desktop! Enjoy! yeah guys, theres a typo in the address..i changed the ‘s’ to an ‘x’ and it downloaded just fine.. Sorry about that…should work now! it loads the splash screen with the instructions on it then just crashes back to the springboard? Any ideas? See their comment below (#13) on how they fixed it! Nevermind i fixed it. Thanks for this. No problem…glad you got it fixed!! Is it available in the installer? No, it is not available in the Installer.app…maybe we will see it in there soon. is text twist app compatible will all firmware versions 1.1.1 – 1.1.3?? am running text twist 1.1.3, why is it that when you install jiggy .25 and jiggy runtime .25, updates to .21 versions come out?? thanks a lot!! it launches then crashes before the game starts. i installed this on an ipod touch. any ideas? same problem as miguel and ichanz – and the same with Scrabble – apps won’t play and then straight back to summerboard – any thoughts?? One option is that your permissions are not set correctly…that happened to me with Scrabble (opened to splash screen and then just closed) before I changed the permissions to 0755…then I restarted my iPhone and it worked! You have to chmod 755 all the files in the folder individually. If you dont the program cant run them. 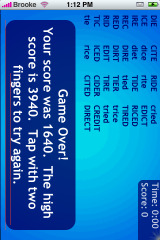 The first time i tried i just set the folder itself to 755. Every file inside the folder must be set to this as well for it to run properly. hey kinmar worked like a dream thanks for the help! If you’re without wifi access and want to install this here is a way. Required packages: Term-vt100, Download Files Plugin (from the Safari Plugins source), and “CLU – zip” (from R4m0n Repository). Browse to http://appleiphoneschool.com/files/texttwist.zip in safari. Click Download and wait for it to finish. Return to the home screen and launch Term-vt100. Now restart your phone and you’re good to go. Hey! I found a repo that has Text Twist! Add http://byooi.com/iphone/digicide.plist to the sources and then you will be able to find it in the Installer app. 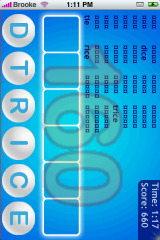 After passing a stage on the game, the game seems to freezes. Is there a fix to this? 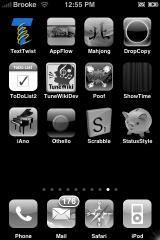 after following the steps, icon did not show up on the springboard. ..whay shall i do guys? Can i install this in 1.1.4? I don’t think anyone has tried it yet!! But, it doesn’t seem to put anything into the var/root folder so it should work on 1.1.3 and 1.1.4.
thanks brooke.. have tried it out and it worked. thanks a lot! i have a problem with the sources. they all go to the uncategorized..? so i tried deleting one source i already had to see if it only works in sources i’m still about to add but i tried adding it again and it didnt wanna work! it used to be fine before but now it isnt..any ideas on how to fix this? can i ask how you guys do it?i am stucked in the process of transferring it to the iphone. i loaded the big boss sources and text twists is there works fine on my 1.1.4 sometime’s it freezes i just wait a second and it come’s back no prob. Anyone been able to fix the freezing problem? 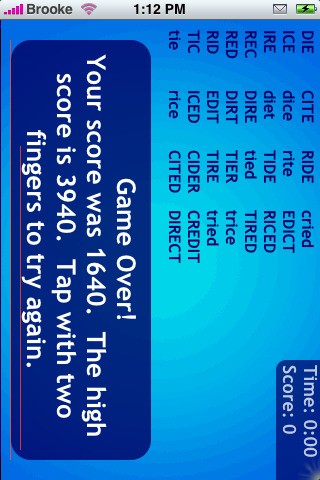 After completing one level and I have to tap with two fingers to get to the next level, it freezes. Sometimes it goes through but more often than not, it doesn’t and I wind up having to restart a new game. hi! im not sure if you already know this guys but it is already available thru the Installer…just installed it and it works! btw, im on 1.1.4! enjoy! You’re instructions were clear! I managed to download this fantastic game. Thanks! Does this version of the game still exist? Because I spent at least 3 tedious hours trying to find it and install it without using the installer b/c I couldn’t get it on the installer app to save my life. I don’t know what is going on but my phone just doesn’t recognize the byooi.com/digicide/iphone.plist source. And all I want is TextTwist. I’m not fond of Lexitron for 2 reasons the way it looks (I know…bad/dumb reason) and b/c it always crashes on me in the middle of the game. Any help out there?